Few months back we had posted an article about login with Twitter and Facebook, it is most popular on 9lessons.info. 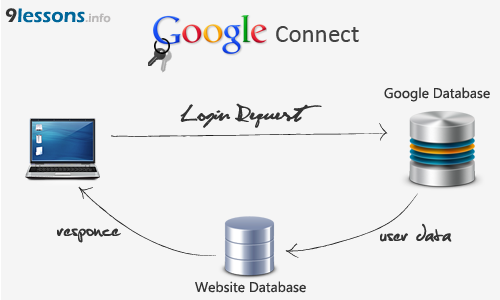 We developed a system to quick login with Google account using OpenID authentication. This script helps you to avoid registration forms and email verification system, It’s is very quick, useful and simple to integrate. Login with Google Plus OAuth. In root directory find out the below line at login-google.php code and replace yourdomain.com with your own domain value. In home page you can display user details by accessing session variables. nice and excellent tut, but in demo some redirect errors..
oauth_uid doesn't post to the users table? value is '0'? The requested URL /high_cpu.htmlsubscribe/index_google.php was not found on this server. Hey, it's easy to login with Google. Thanks for tut. it is great. Thanks! Looks easier that FB login. Thanks for sharing the post. Nice tutorial. Would like to try it. is the oauth_uid supposed to be 0? very nice tutorial, i like. thanks. Server CPU overload please try after sometime. when i use it on localhost then line no 86 of openid.php gives error in curl and wrapper() functions. I got this . Can you help me to solve the problem ? Me too getting the same error as Zern. author! please respond..
i am trying to download it ..
Kurwa w chuj to nie działa ! thanks for the script. it works!!! after clicking sign in button in gmail i got an FORBIDDEN error in my server. how to solve it. any help will be apriciated. It only works for @gmail.com accounts, not for other Google Accounts..
Hi there! this is one of the most useful script for me at the time..thnk u!! I need a little favour can we login with gmail account without going on the gmail login page. Plzz suggest me!! i'll waiting for ur feedback.. I can login on example page with your credentials. oauth_uid doesn't post to the users table? isn't there a oauth id at google ? It stores only my username and email address.. why?????????? How to get country and language? Here, using this Google API you can get only the three vales name and email info. you can't get gender , profile photo and other info you can't get here. for that you have to go to Google plus API. Java sample code is available? Do you know if this process also supports login in with a Google Apps account? i have a problem in 'oauth_uid' What is this for as no value is entered when the user logs in? Please Help, I think may have this problem. Now just get only email. Live demo url is not working, please check it. I think almost all of us are using Google account so it is very convenient. Thanks for share. How can we do this login in a popup and get the data in the parent window? You don't have permission to access /int/sign_in.php on this server. Instead of domain name i used the localhost . i am getting empty page . is localhost domain name work ? Good Tute, But if you cance the "No Thanks" Info, it does not redired in "Demo"
I download this script in my server. unzip that script. http://localhost/google-openid/login-google.php page displays empty . Please help me . Thanks , thanks a lot , it also working localhost also. hi thanks for great tutorial. After login to gmail, how can i get contact list. there is no function for this in functions.php file. This tutorial works well but I need to get the User Google ID in addition to the names and email. I did not find anyway to do so. Do you have any clue ? Nice tutorial but when I'm running it on localhost I'm unable to be redirected to home.php page. Can u please elaborate more on callback URL. what actually it is. "You don't have permission to access /phpinc/fbtlogin/getGoogleData.php on this server. You don't have permission to access /phpinc/fbtlogin/getGoogleData.php on this server. $uid not valid , what it's mean ? Can you explain it for me ? The logout is not clearing the session values. I am still logged in after clicking logout... anything wrong with the script. It's a great script though. i m facing the same issue as suresh mentioned earlier .. hope u solve this issue..
Error in parsing the OpenID auth request. this line is in getGoogleData.php, where is the $uid comes from? what are the following files? where to get these files? Hi! This is really great but I'm just wondering if this can be done using Ajax? If so, do you have a code for that one..? Thanks! hiiiiiiiiiiiiiiiiii this is great plugin but url redirect problem ocarr. Hey nice tutorial man... U make it so easy... Thanks buddy!! This is really very nice stuff,but can somebody explain me what is the value of $uid which is assined to $_SESSION['oauth_id'] = $uid; in getGoogleData.php file. Because am getting "Error in parsing the OpenID auth request." Error. How to restrict my users to login only with their Google apps account using above method? You don't have permission to access /google-o/getGoogleData.php on this server. everything is working fine except the logout.php. even though i click "logout from google" i am still logged-in in the gmail. the session destroy is not logging me out from the gmail. please help me someone. thank you. Do we need to provide oauth key or any API key? very nice tutorial, i like. Nice cool, is very terrify!! Awesome Srinivas. Loved it. Very easily installed on my website and working fine. Can I use OpenID for logging to Yahoo and other accounts as well? NIce article but how to download the code ? how can I get it to ask for additional fields that user has to fill manually before it completes the registration? I am trying to send html form in email and the user can respond to it. In case I am sending the html form to a gmail distribution list, how can I capture the gmail id of the person who is submitting the html form in email? Any suggestions or workarounds are welcome..
nice one man, just what i was looking for! thank you. Hey bro,I don't know php ...can you tell me how to login gmail using asp.net?? ?pls reply me. I was looking for Facebook login for my site. Thanks for the post. Hello friend , register domain problem , how to resolve it? Hello, this demo doesn't work, OpenID has a new version and it's necessary migrate to it. Please can you update this example? Thank you.